An additional area of research we are involved with concerns multi-ferroic fluorides. For our purposes, multi-ferroic materials exhibit ferroelectricity, i.e. reversible polarization, and some sort of magnetic ordering (ferro-, anti-ferro, ferrimagnetism). The interest with multi-ferroic materials stems from their applications in information storage. Suggestions have been made that on a single multi-ferroic bit, information could be independently encoded by both polarization and magnetization. We are investigating magnetic ordering in materials that undergo a ‘non-classic’ ferroelectric mechanism, e.g., BaNiF4 (see Figure). 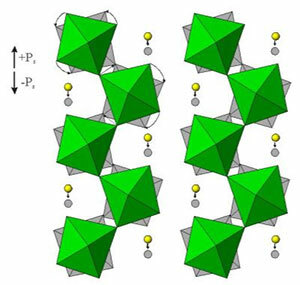 As seen in the Figure, the green octahedra and yellow spheres represent the structure of the ‘up’ polarization of BaNiF4, whereas the gray octahedral and spheres represent the structure of the ‘down’ polarization. The structural re-orientation through the NiF6 octahedral rotations and Ba2+ displacements result in the polarization reversal, switching between ‘up’ and ‘down’, i.e. the ferroelectric behavior. We are investigating a host of mixed-metal fluorides that could undergo this non-classic ferroelectric mechanism and exhibit magnetic ordering. Kim, S.W., Zhang, R., Halasyamani, P.S., and Hayward, M.A. K4Fe3F12: An Fe2+ / Fe3+ Charge-Ordered Ferrimagnetic Fluoride with a Cation-Deficient Layered Perovskite Structure, Inorg. Chem., In Press, 2015. Thao, T.T. and Halasyamani, P.S., Synthesis and Characterization of ASnF3 (A = Na+, K+, Cs+), J. Solid State Chem., 210, 213-218, 2014. Kim, S. W., Kim, S.-H., Halasyamani, P. S., Green, M. A., Bhatti, K. P., Leighton, C., Das, H., and Fennie, C., RbFe2+Fe3+F6: Synthesis, Structure, and Characterization of New Charge-Ordered Pyrochlore-Related Magnetically Frustrated Mixed-Metal Fluoride, Chem. Sci., 3, 741-751, 2012. Liang, K.-C., Zhang, W., Lorenz, B., Sun, Y.Y., Halasyamani, P.S., and Chu, C.W., Weak ferromagnetism and internal magnetoelectric effect in multiferroic LiFeP2O7, Phys. Rev. B., 86, 094414-1-094414-7, 2012. Kim, S.-W., Chang, H.Y., and Halasyamani, P.S., Selective Pure-Phase Synthesis of the Multi-Ferroic BaMF4 (M = Mg, Mn, Co, Ni, and Zn) Family, J. Am. Chem. Soc., 132, 17684-17685, 2010.